I read last month at the Blue Space Poetry Jam in a small but distinguished gallery space in the wilds of industrial Sydenham. It was renamed the Blue Stocking for the night because all the readers were wimmen. Michele Seminara was the MC and Ariel Riveros Pavez the mastermind. It was a powerfully warm experience. I have just received a letter from the Office for the Arts telling me my poetry book, ‘Late Night Shopping’ has been recommended as a highly commended work in the Prime Minister’s Literary Awards for 2013. This is very pleasing considering the quality of the competitors in such a top notch prize. My congratulations to the winner and the five short-listers. While in Broome last week I was invited by Environs Kimberley to be their literary guest at the Full Moon Beach Walk fund-raiser: over thirty energetic souls walked 5km along Cable Beach to Minyirr Park where they sat around a campfire under the full moon, ate homemade soup and listened to my poems and a reading from my novel. The wind died down, the full moon shone, and the mozzies bit… don’t say I don’t suffer for my art. Rabbit is a beautifully-presented quarterly journal of non-fiction poetry. Kit Kelen, from the University of Macau, has included a poem of mine in his forthcoming anthology, ‘Notes for the Translators’. The idea is that the author writes helpful notes on the poem for the translator to understand particular language tricks and cultural references. It’s a great idea and I’m looking forward to seeing the book in the New Year. The poem I chose is called ‘Mortal Bite’, ostensibly a poem about a nervous rabbit. Happy to say I have a poem in this year’s anthology – that’s three years in a row. I have a poem in this anthology edited by Irma Gold and published by Halstead Press that celebrates writing from the Canberra region, including a terrific essay from Kim Mahood, and a wonderful poem from Judith Wright. The ABC will re-broadcast their program Poetica: Touch on 29 December 2012. I have one poem in this program called … ‘Touch’. I’ve been shortlisted for the Judith Wright Calanthe Poetry Award. These new awards were set up to counteract Premier Campbell Newman’s axeing of the Premier’s Literary Awards. Thanks to the judges and organising committee for their great efforts. See the shortlist under Archives: August 2012 … on the right of the page. See under Archives: August 2012. “…almost all of the poems here are marked by a wry, low-key humour – whether they are about our sexual, domestic or social relations – or our existential situation in the cosmos. Some, such as her instant classic about sheep, “Arrogant Animals” are almost satirical. 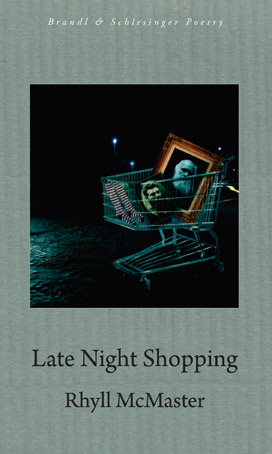 Late Night Shopping is an engaging series of contrasts in subject matter, tone and technique – held together by an overarching and mordant intelligence.” – Geoff Page, Canberra Times, 27.4.2012. I had an appreciative audience at Donbank last week, and discovered two literary admirers who had followed my poems since my first book, The Brineshrimp. I also found an appreciative audience while visiting Broome, W.A. They took me out to the best restaurant out of town at the 12-mile and wined and dined me while I read from Late Night Shopping and my novel, Feather Man. They are planning a literary festival in Broome next year … more on that later. I was part of a panel talk and reading from the Lehmann and Gray ‘Australian Poetry Since 1788‘ event at the SWFestival last weekend. An appreciative crowd attended, interested in discussing this important anthology and hearing some of the poets read their work. This year Gleebooks surpassed itself stocking the Festival Bookshop, and they had my new poetry book, Late Night Shopping, and my novel, Feather Man on display. Some good friends and interested poets braved the cold to help me launch Late Night Shopping the other night at Sappho Books Cafe. Geoffrey Lehmann gave me the best launch speech ever and the evening was further highlighted by Robert Gray reading his poems. I’ll be reading my poems along with other Brandl & Schlesinger poets at the SWF event at the Carrington Hotel, Katoomba, on Monday May 14 at 4.30pm. Postscript: Such an appreciative audience at this event – they made ‘ooh’, ‘aah’, ummnh’ noises after each poem of mine! Flattering! My new poetry book, Late Night Shopping, Brandl & Schlesinger will be launched by Geoffrey Lehmann at Sappho Books Cafe & Wine Bar on Tuesday April 10, 2012 @ 7pm. I just love the cover designed by Andras Berkes-Brandl. I’ve been included in an anthology of 100 years of writing in the ACT region called The Invisible Thread, to be published by Halstead Press. It will be a National Year of Reading flagship publication. They will also have extracts published on their website for promotional purposes to provide an overview of Canberra regional writers locally and internationally, and for use by festival directors, readers, schools, embassies and libraries. This website will be hosted by the ACT Writers’ Centre. I’ve just had two poems accepted by turnrow books/University of Louisiana at Monroe who are publishing an anthology of contemporary Australian poetry in 2012. The editor is John Kinsella. Both poems will be in my next poetry book, Late Night Shopping which is coming out in April 2012 with my publisher, Brandl & Schlesinger. I’ve seen a draft of the cover, and I think it’s brilliantly appropriate. ABC Radio National regularly broadcasts Poetica, a program dedicated to the performance of poetry. During October they will be broadcasting a series on ‘The Five Senses’, and will be using my poem called Touch, on 1 October, 2011. Editor John Tranter has just accepted one of my poems for this year’s Best Australian Poems – and it’s the title poem of my forthcoming collection, Late Night Shopping, so that’s serendipitous. I’ve also just had a poem from that collection published in Meanjin 3, 2011. Meanjin has the best looking cover – a beautifully-laid-out magazine. Geoffrey Lehmann and Robert Gray’s immense anthology of Australian Poetry since 1788, UNSW Press, will be out this month. I have 11 poems represented, and the anthology looks set to cause some waves through poetry circles. Watch out for a review of it in Australian Book Review soon. My novel, Feather Man, has now moved north-west of Beijing to be published in translation in the Ukraine. How exciting is that? It will be published in the magazine Dnipro in two instalments, and then in book form. The Red Room Company, www.redroomcompany.org, has a link-up with the Sun Herald newspaper to publish poems, and my poem, Darwin Fulminates on Hybridism, was published last weekend. You can read it online at the Red Room Company Sun Herald ‘Extra’ site. Brandl & Schlesinger will publish my next poetry book, Late Night Shopping, in April 2012. I’ve just realised there’s been a 15 year gap since the last one, Chemical Bodies … but there was a novel in between. I’ve had news from my Chinese translator that Feather Man is now published. I haven’t seen a copy yet, but I’m waiting patiently for the slow boat to arrive. And I had an invitation to go to a literary workshop in China which I had to decline because I was already booked into the Watermark Literary Muster at Kendall, mid-north coast of NSW. There I met many splendid writers including the classical Gay Bilson, the hilariously clever Kate Llewellyn, the moving Ali Cobby Eckermann and the charming natural history writer Robert Pyle from the USA. We had to fly through ash clouds and wade through floods to get there, but it was worth it. I was delighted to be awarded the Commendation Award in the Josephine Ulrick Poetry Prize from Griffith University in Queensland. $2500 is very generous. Even better that I’ve won something from my home state. The lovely Amanda Moriarty introduced me as ‘angelic’ at my poetry reading last night at Sapphos Cafe. A very appreciative audience, and a great open mic. competition with my daughter, Stella, reading – she only discovered afterwards that I was de judge! Onwards and upwards for nepotism. I’ve been invited to read at Sapphos Cafe Bookshop & Wine bar on May 10, 2011. Come and hear me read from ‘Late Night Shopping’ whilst eating tapas (that’s you eating the tapas … I’ll refrain until after my reading). The Two Fires Festival was an interesting amalgam of sessions on activism and the environment, and some very well-attended literary sessions. I read poems from my forthcoming book, ‘Late Night Shopping’. I particularly enjoyed listening to Terry Jaensch and his orphan experiences – that man can write! Congratulations to all the shortlisters. This year I was a judge and overall chair of the awards committee, a fantastic group of people. You can read the judges’ biographies on the website. I’ve been invited to take part in the Judith Wright Two Fires Festival in Braidwood. My hubby, Barry Waters and I were involved in the inaugural Festival, and it’s still going strong. It covers Arts, Activism and the Environment – all things close to Judith’s heart. A Festival with a difference. Runs from April 1-3. Check it out. http://www.twofiresfestival.com.au Among the contributors to the three-day event will be Fiona Capp, Alan Gould, and the artist John Wolseley and Barry Hill who have collaborated on a book called ‘Lines for Birds’. I have had an email from my Chinese translator who wants to ask me some questions. How exciting! I’ll keep you posted on developments. I was asked to chair the Three Australias panel yesterday – 22 May – Three Poets, Three Voices, Three Views of our country – with Les Murray, Kim Cheng Boey and Ali Cobby Eckermann. I don’t know about them, but I had a great time asking them questions after their readings. Kim Cheng is a Chinese Singaporean emigre, Ali Cobby Eckerman is a Nunga poet who speaks out strongly about what it’s like to be Aboriginal, and Les Murray speaks of being from the rural poor. I asked them where they felt “at home” and questioned whether we only really feel at home in our heads – with some interesting results. There was an attentive audience of about 200, so poetry is strong and well. I was one of three judges on the NSW Premier’s Awards for fiction, and the UTS Glenda Adams Award for New Writing. We had 98 books to read. Some were very good indeed, and some were not quite good enough. Still, I was honoured to be asked to consider all of them – it’s a serious task to sit in judgement on other writers. J.M. Coetzee won for Summertime whose last paragraph brought tears prickling to my eyes (a great test), and Andrew Croome won the UTS award for Document Z, moody and heartrending. I had a poem published recently in Australian Book Review, and that got me an invitation to speak at the next Watermark Literary Muster in 2011. The topic will be Backyards, of which I have known about 14. Last week I had a film crew in my bedroom (which, needs must, is also my workroom), recording and filming me for a segment in “The Writer’s Room” to be shown soon on ABC TV. It took about 4 hours to immortalize me for a 5 minute film – it’s a very interesting process to watch being made – a bit like constructing a moment in the life of a novel. It made me wish I could wield a camera instead of having to describe the scenery so painstakingly. Anhui Literature and Art Publishing House has bought the translation rights to Feather Man for mainland China. The rights were sold by my dedicated Australian publisher, Veronica Sumegi at Brandl & Schlesinger Publishers through one of the largest literary agencies world-wide, Andrew Nurnberg Associates. As a Sinophile since childhood (there were lots of Chinese toys around when I was a kid, and I walked through Brisbane’s Chinatown to get to school each day) I am very pleased with this turn of events. I travelled through China on the Trans-Siberian railway about ten years ago, from Beijing and through Mongolia… a memorable train trip. I can’t wait to see the Chinese version of my novel. The Literature Board of the Australia Council has given me a $60,000 New Work – Established Writers’ Grant over two years, 2010-2011, to support me in writing my next novel, Oceania. This means I can live in the land of prose without disruptions – a scary yet exhilarating thought. The Australia Council’s Literature Board encourages the development, promotion and enjoyment of Australian literature, as well as writers like me, and it would be a hard environment without their support. My two weeks’ residency was productive (I’ve now transferred my next novel, Oceania, from my head to the page), pleasant and invigorating. Loved the company I kept, the readers I met, the students I spoke to, and the pink sheep (Wagga is a red soil sort of place). Didn’t quite love the resident possum whose nocturnal emissions flavoured the air in the bedroom. … the smell is reminiscent of slightly damp babies’ nappies. I really enjoyed dissecting my novel under the intelligent questioning of the MA students, but it’s quite a surreal process trying to recall what my motives and reasonings were almost ten years ago when I set out to write it. Our lives are a continuing work of fiction, I believe, and as Feather Man started out with the title Pure Fiction, my answers to the seminar group were probably all made up. September 3, 10, 17 I’ve been asked back to Sydney Uni by Prof. David Brooks to run some sessions with the MA students in Creative Writing. We’ll discuss me, me, me again – or rather my novel, Feather Man, and the writing process. Although the Festival is open to the public – of course – and well-attended, this Festival is more like a literary conference – with the added attraction of Stefano’s great slow food using fresh local ingredients. After all, Mildura is one of Australia’s biggest food bowls. None of the sessions overlapped one another, so everyone could hear Alexis Wright (“Carpentaria”, winner of the Miles Franklin ), Christopher Koch (“The Memory Room” and two-time winner of the Miles Franklin), Robert Gray (he was interviewed by Virginia Trioli about his memoir “The Land I Came Through Last”), Sophie Cunningham (“Bird” and editor of Meanjin), Peter Goldsworthy (the genre-traveller: poetry, novel, opera, theatre), Ronald Sharp (a Vassar College professor, who gave a fascinating address on “Mateship, Friendship & National Identity”), a host of others and, wait for it – me. Asked to say which book has been transformative in my career, I chose ‘The Enchanted Wood’ by Enid Blyton. It’s a seriously good read. Off to Mildura to join in some panel talks about poetry and prose – and to eat gorgeous food cooked by Stefano de Pieri of “Gondola on the Murray” fame. Had a great time running the poetry workshop at the NSW Writers’ Centre on 28 June. The 18 participants did all the work – and what an inspiring mix of people. I’ll do it again on the 14th November. Speaking of poetry, I’m to do a reading at Sappho’s Bookshop on Wednesday 9 September. I’ll also judge the poetry slam… should be fun. I’m to have two poems published in Motherlode: Australian Women’s Poetry 1986-2008, to be published in 2009 by Puncher & Wattman. As all my poetry books are out of print now, this is a welcome event. Have a read of Eileen Chong’s definitive essay on Feather Man: Reclaiming Identity in Rhyll McMaster’s Feather Man in Hecate Vol.34 No.2 2008, available now in all good bookshops (well, certainly in Gleebooks). Check out my article in Australian Author, April 2009: Letter Home, titled England, later… I first went to London in 1972 and returned last November, thirty-six years later, to attend the Southwold Literature Festival and promote my novel there and in Paris. I had a great time with Martin Harrison, Mark Tredinnick, Brook Emery and audience at the 3rd Fiction Festival at the Writers’ Centre on April 4. I had ten minutes to discuss the truth of fiction and the fictional nature of poetry – I think I sorted it out. Sooky’s Relationship with Redmond Defended! See Eileen’s masterly defence of the Sooky/Redmond relationship in her Comments at Feminist Review. I do love a vigorous discussion. Well, they pretty much liked Feather Man at Feminist Review... ‘ feminist themes are plentiful’ … ‘a strong feminist sensibility’. I didn’t think that way when I was writing it: I was just trying to get as close to the truth as I could. They thought there were a few holes in the Sooky/Redmond relationship. (I think Sooky did too). See what you make of their comments. Robin Dawson thinks Feather Man is fantastic – 4.5* review on 15.Jan.09 – and what’s more this link is translated from the French – how cool is that? On the other hand, Monica and Samantha aren’t such happy readers… can’t win ’em all. In his Forum column Peter Craven suggested some enduring classics of Australian literature from the past 30 years or so (“On Australian classics”, January 24-25). Lists like this are always difficult to compile but I thought one glaring omission from his list was Sally Morgan’s My Place. And various titles by Raimond Gaita, Rhyll McMaster, Ruth Park, Mandy Sayer and Tim Winton wouldn’t be out of place either. Geri Badham, Waramanga, ACT. I’m to spend two weeks in wonderful Wagga, (not even the residents call it Wagga Wagga it seems) in residence at the Booranga Writers’ Centre (part of the Charles Sturt Uni campus) from 9-23 October. What an opportunity (the funding is supported by Arts NSW) to speak to readers, students and other interested parties about my novel, and get down to writing the next one. And I’ll appear on a panel focusing on poetry to fiction at this Festival at the NSW Writers’ Centre on Sunday April 5. I spoke at the Festival last year and it was a great audience. I’ve been invited to the Mildura Writers’ Festival 16-19 July. I hear this is the most well-regarded Festival around. Artistic director is Paul Kane of Antipodes magazine (the Aust/US mag) and past president of the American Association of Australian Literary Studies, and the Chair is Stefano de Pieri of cookery fame – so it’s got to be a winner. Just got word there will be a review of Feather Man posted on the 11 February in the Feminist Review. The site looks interesting, so I’m looking forward to their opinion. Thanks for all your votes… sadly didn’t make it to the Short List. Feather Man has 12 reviews on the online LibraryThing site: here’s a ****star one from shawjonathan. My interview was aired across America on December 18… how exciting. Have a listen here. For those of you old enough to get the reference: “They see (her) here, they see (her) there…” I’m everywhere these days. Find me on Facebook and check out my hot entry in Wikipedia. A bunch of ****star reviews on amazon.com are driving a ton of traffic to the site, according to the Literary Ventures Fund’s Andy Zellman. Whooo… maybe Santa is arriving early this year. See the reviews and comments on Customer Reviews. Even though I have a link to them on my Links page, and under Articles & Reviews, I have just realized that I haven’t boasted enough about my review from Helen Oyeyemi in the New Statesman earlier this year, and the fabulous review from Lisa in the online Vulpes Libris – so have a look before the year ends. Vote Feather Man onto the Spread-The-Word shortlist before 2 January 09. Go to www.spread-the-word.org.uk and register and vote. The Southwold Literature Festival was great fun. I was on a panel with an extremely nice writer called Sadie Jones whose book The Outcast had parallels with mine. Southwold’s pebbly beach looks out across the moody North Sea, so I took the opportunity to skip a stone across it (it bounced twice). While in London I was interviewed by the BBC for the American program The World, hosted by Lisa Mullins. This is a co-production by Public Radio International, BBC World Service and WGBH Radio Boston, and is a world first global radio news program broadcasting right across the United States. We can’t get it here, but they’ll send me a link when it has gone to air. It was so exciting swanning into the BBC studios on The Strand – self-importance was high on the register. And while in Paris I was invited to sign five copies of Feather Man into the famous (so famous it’s in the Guide to Paris) English-language bookshop on the Left Bank, Shakespeare & Company. Never thought my tome would travel so far. From the hundreds of thousands of books published this year, the Indie bookselling community in the US has gleaned an impressive 2008 Indie Next Highlights List, featuring great fiction and nonfiction that has garnered especially strong support from ABA members nationwide. The list includes 51 titles, and FEATHER MAN IS ON THE LIST! ‘Spread The Word’ Longlisting for Feather Man in UK. World Book Day (U.K.) has selected Feather Man for the longlist for ‘Spread the Word’: Books to Talk About 2009. This promotion is backed by WH Smith who stock the winning book in all outlets, including airports. NOW VOTING IS OPEN INTERNATIONALLY. Please vote Feather Man onto the short list before 2 JANUARY 09. To see the longlist go to www.spread-the-word.org.uk, where Feather Man is looking pretty winning. Here is the full edited Feather Man Discussion on the Barnes & Noble site. I can’t recommend the Barnes & Noble online ‘Book Explorers’ Club highly enough. Feather Man was discussed in detail, with serious passion and frank critical commentary, over a month. Free copies were sent out to those readers who agreed to join the discussion. There was even a reader from France. Ande from the Literary Ventures Fund was the moderator supremo. Handily, Feather Man is written in 4 sections, so they discussed it one section per week. There were over 600 posts and some posts were viewed over 500 times. I joined the discussion over the last week. This sort of well-structured ‘virtual’ book group discussion, concentrating on one book per month, is a win/win situation for readers, authors, booksellers and publishers. It’s just begging for a consortium to pick up the idea here in Australia. The WOMEN’S NATIONAL BOOK ASSOCIATION has declared October to be the National Reading Group Month in the US. Authors of reading group favorites will appear at events across the country sponsored by WNBA chapters. FOREWORD MAGAZINE has suggested FEATHER MAN as one of six novels reviewed in their September issue for library reading groups to discuss in October, as part of National Reading Group Month. I love the idea of my novel sitting on a table in Raleigh, NC just waiting for someone to pick it up. I so enjoyed these seminars with the MA students in Creative Writing. Under close questioning it was a great opportunity to discover my own methods, such as they are. Check out Julie and Eileen’s comments. And a belated thank you to Helen Palmer, whose contact details I don’t have, for her wonderful gift of the City Walks of London. You are so kind, and I shall walk as many as I can when I go to London in November to publicise my book. Feather Man gets a Pick of the Week recommendation in the Boston Globe newspaper, 28/9/08. How about that! Feather Man is rating well on AMAZON reader blogs with 4 and 5 stars. And MOCKDUCK – see under “Blog Power Rules. Or Not?” – and ME AND MY BIG MOUTH have things to say about Feather Man too. I didn’t get monstered or criticised by Sandy Amazeen in her September 14 review at monstersandcritics. Read Nancy H. Fontaine’s review (she liked it) in ForeWord Magazine in the US. ForeWord specializes in reviews of good books independently published. I did my first seminar last night and I had a great time. I guess they did too, because we didn’t clock watch, even though it was a two hour session, and we laughed quite a bit – must have been having a good time. What a privilege to sit talking about my novel to 18 intelligent people. Next week we’ll look at how I’ve hidden my own poem fragments in my novel – post-Modernism without fees! Picaro Press, PO Box 853, Warners Bay, NSW 2282 – www.picaropress.com – publish their Wagtail magazine eleven times a year. Each issue features a single poet, and all back issues remain in print. See March 2003, #19, Rhyll McMaster’s The Elegant Rabbit. Now they are going to reproduce my out-of-print poetry book, Washing The Money, in their Art Box Series. This series aims to provide low-cost access to significant Australian poetry titles which, for whatever reason, are no longer generally available to the public. Great idea and the series looks stunning. Literary Ventures Fund who are promoting my novel in North America run an online Book Club called ‘Book Explorers’, hosted on the Barnes&Noble site. This month my book is under discussion, and in the first few days there are already about 90 passionate comments on the first section of ‘Feather Man’. At the end of the month, on September 28, I will join in the daily online discussion over the course of a week. Australian readers, who might have already digested the book, are welcome to join in the discussion. The folks at B&N would welcome any new eyes (especially international ones)on their site – a sort of US/Australian Literary Alliance Thread. Sydney friends agree this could be great fun, and think this is just the sort of thing we should have running here, but given that we don’t seem to have a comparable interactive online Book Club discussion group operating, (why is that so?) to join in the Book Explorers discussion is the next best thing. You can choose either to have a look at the posts so far, or take part by registering (it’s free), signing in, and participating in the discussion with your own comments. It needn’t stop with my book, of course. The LVF regularly choose books for discussion. My ‘discussion’ has already begun, but it’s not too late to join in. Go to the LVF’s Book Explorers Club and click on the thread “Feather Man” Discussion Part 1 (Lionel)-pages 13-107. There are guides to how to Register, Sign In, and a Help guide. I love discussing my book with readers, and the Melbourne crowd were smart, passionate and receptive, and I got to meet some fellow writers, Sophie Cunningham, Joan London, and Gil Adamson from Canada. Not to forget the dedicated panel moderators, Aviva Tuffield from Scribe Publications and Kirsten Abbott from Penguin, who steered the conversations so adroitly. Great venue, good vibe. I’m heading off to the Melbourne Writers’ Festival 30-31 August to take part in two panel sessions. Session Saturday 30 August, 1.15pm., and the topic is Mad, Bad And Good Mothers: Whoever had a mother straight out of Women’s Weekly? I’ll be appearing with Sophie Cunningham and Mirielle Juchau. And then… I will be conducting three 2-hour seminars with the MA students in Creative Writing at Sydney University, under the auspices of Dr David Brooks and the Writers At Work program. I’m really looking forward to these discussions – after all, how many authors get the chance to talk about their book for 2 hours to a captive audience? Off to entrance audiences in the Fens country, home to writer Graham Swift, at the Southwold Literary Festival, in the UK, November 6. It’s a beautiful place by the looks of it, and I’ve always wanted to gaze out over the North Sea. See the Southwold program here. Want to read my daughter Stella‘s dreamy blog? Mmnh… family insights! You Are What You Read review. Here’s Loretta Kelly with her July 9 2008 review of Feather Man. Never let it be said that I don’t love Australian online reviews – here’s one from Literaryminded, Angela Meyer, an Australian Gen Y writer whom I met at the Byron Bay Writers’ Festival. Dovegreyreader finally bites the bullet. Dovegreyreader reads past the first ‘tough’ chapter to discover that she wanted to add ‘Feather Man’ to her list of Booker predictions (now why wasn’t she a judge?) Read review in full. Feather Man has been chosen as a September Indie Next List pick from the American Booksellers Association, which means special promotion in most of the independent bookshops across America. Go here for a Preview and see Feather Man in good company with the latest from notables Annie Proulx and Paul Auster. Rhyll is a committee member of Sydney PEN, which is a chapter of PEN International. PEN promotes literature and defends freedom of expression. Go to the PEN website to check out their work for prisoners of conscience. Read Meghan’s complete review of ‘Feather Man’, July 9. Read Lynn Stegner’s and Nancy Felton’s US reviews on the Literary Ventures Fund site. Read Rhyll’s Tuesday Top Ten pick for Mark Thwaite’s Editor’s Corner at The Book Depository. Read Meghan’s review in The Sunday Salon at Medieval Bookworm. Meghan is a 22year old at Brandeis University and she loved Feather Man. Here is what Devourer of Books says about Feather Man. Read Rhyll’s interview with The Book Depository’s Mark Thwaite. Judges’ comments: McMaster has written an exquisitely crafted first novel rooted in the mundane and the mythological. In a language that is both poetic and visceral, she dissects her characters’ motives with a dispassionate gaze, revealing the darkness at the centre of their lives. Feather Man short-listed for the Australian Literary Society’s Gold Medal 2008 for an outstanding literary work. Feather Man wins the inaugural Barbara Jefferis Award 2008 for the best novel written by an Australian author that depicts women and girls in a positive way or otherwise empowers the status of women and girls in society. Judges’ Report: This is a powerful, original novel, wonderfully well written. As an account of a young woman’s survival of a dysfunctional childhood in Brisbane, the coming of age theme avoids all the usual clichés. The story of Sooky’s gradually emerging independence is told in prose that is rich, lyrical and assured, and the portrayals of the characters in all their fabulous monstrosity ring absolutely true. Sooky – flawed, self-doubting, difficult, sensitive, painfully honest and supremely talented is struggling to make sense of her life and establish her identity as a painter. In so accurately analyzing the way Sooky uses her intelligence, wit and unconventional view of the world to fight herself out of the dark hole of her childhood, McMaster has created a fresh and original woman character who is at the heart of this brilliant, witty and disturbing novel. I attended your How Poetry Works day at the NSW Writers’ Centre and I just wanted to say thanks for an excellent experience (as far back as it was). You kept up the enthusiasm all through the very long day and didn’t cut anybody short. I was the second last reader and I felt as though you spent as much time on my work as you did on the very first poem of the day. Benjamin! Thank you. I remember you and your poem, which was excellent. I’m doing a poetry reading and judging the open mic comp. @ Sappho’s cafe in Glebe Pt. Road (next door to Gleebooks) on Sept. 9, 7.30pm. You should come along and read a poem in the competition. Thanks for the feedback. Hi，i am the translator of Feather Man in China (still doing this) , and i ‘m also writing a thesis on this novel, so i really need your help, wish you have time do some interviews, if you agreed, pls send me an email back. by the way, the book is possible to be published in October. Hi leafie, I have emailed you. I look forward to talking with you about the translation of Feather Man. Hi，i am the Chinese translator, you can call me Joe for short, i’ve sent you two emails with details, but it seems to be returned by the sever, i don’t know whether you’ve received them. so i changed the other email address, looking forward to your reply soon. Rhyll – I have just read Feather Man and am gob-smacked by the accurate pathology (if unikely luck) of your herione (personal experience). How do you know? Why no ‘happy ending?’ . DUH. The thing is – you have (in Feather Man) written a book (if I could write) what I would write if I were capable. I am a genuinely gifted artist (see COCA/Nina Cook) and (upcoming website: ninacook,co,nz) . If you write anything further on this subject. please consider my work (you can have it for free). I never read your poetry before, but will now – how do you you know this? Are you another? Are you just freakishly good at research?…because that would be wierd. Hi Nina – Glad you liked Feather Man (which is currently getting translated into Mandarin). I have done a lot of research into narcissistic patterns of behaviour (Redmond), and into the high incidence of child sexual abuse. As any writer does, I have put that research together with personal experience, anecdotal evidence and stories from friends and acquaintances, to try to make believable characters who act out my ideas of what goes on in the world (especially behind closed doors). I am not an artist (not even a hobbyist), but I have friends who are artists, and they have allowed me to sometimes watch them work. One artist friend checked out my painting techniques to make sure they made sense. Most of the paintings were based on dreams I had – I kept a dream diary for a couple of years. The biggest factor in all this is the art of fiction. Whatever I might know or have experienced becomes larger than life when it hits the page. It becomes something other than anyone’s everyday experience – which I guess is the nature of art. Sorry to contact this but I accidentally put your card through the wash! A pleasure meeting you at Watermark. I hope all goes well with your book. How are you? Sorry i missed seeing you at the two Fires festival this year. I’m just wondering if you can email me re some suggestions for published critical material about 20th century Australian poetry. Winter in Braidwood – cold and dismal. But a few daffodils are out …. John Muk Muk Burke here. It was good to share the time in Wagga and Albury and to have you in Wagga as Writer in Residence. After you left I borrowed Feather Man from the library and WOW! what a read. From your blog I gather it’s doing very well: thoroughly deserved too. I hope we can catch up some time but you seem very busy. Congratulations BTW on your wonderful grant. It was great to meet you in Wagga; I have fond memories of that time. As it happens I’m launching the 4W twenty-two magazine today at Gleebooks. If you’re down in Sydney next April you might like to come along to the launch of my next poetry book, ‘Late Night Shopping’. Glad you liked Feather Man. Thanks Mark. What a terrific archive you have there. It’s a very nice review. Speaking of the time between books of mine, there are 15 years between my last one, Chemical Bodies, 1997 and my new one, Late Night Shopping. Both are published by Brandl & Schlesinger, who also published my novel, Feather Man in 2007. I am currently studying my MA and would love to feature an analysis of your poetry based in Nolan’s artwork for my latest paper based around ekphrasis. I would value any thoughts and insights regarding your poems. If you have any time to spare to comment on your style, tone, narrative voice/perspective or beautiful use of imagery I would greatly appreciate it. I am nearly halfway through The Featherman and am entranced by the details of interfamily relationships that must ring so many bells (to coin a silly phrase) for many people; and it is also couched in such precise and accurate language. I first came across your name in Brisbane around the 1960s when my mother taught you maths (I think) at Somerville. Her name was Glynn Palmer and she thought very highly of you; publishing the The Bulletin at a tender age impressed her intensely. I have all of your poetry books and although I find them tricky at times to interpret, the effort is well rewarded.